No you are not seeing things! It really is Wednesday but I missed posting this yesterday - better late than never I guess! How are you today? I hope that you are well. I've been quite busy as I'm on deadline with my book and I leave again on Monday, this time for Belgium and the Netherlands AND London, so I feel a bit hurried to get everything done before I go. But enough talk about work, let's focus on some Etsy shops that I want to share with you for this week. 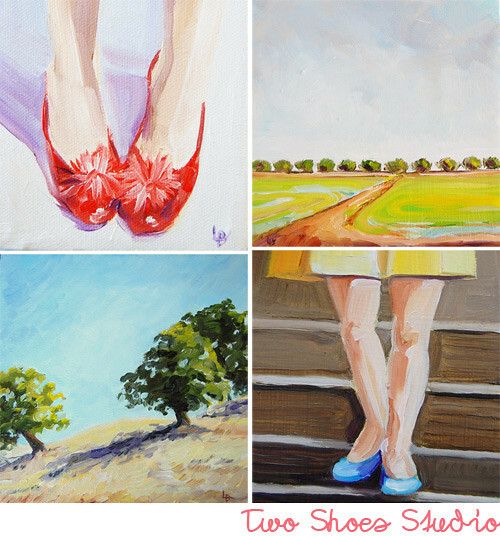 Lauren Brady of Two Shoes Studio sells original paintings and prints and I'm loving her paintings of shoes. I'd love to see her list more originals, I love the brushstrokes and colors, but most of all, shoes make me happy and I love seeing them painted in this way. P.S. Her new website is finished, and it's lovely! Valero Doval is a talented mixed media artist from Valencia who recently had his work in the Pool Gallery in Berlin! His work is attracting attention and for good reason... he is brilliant. 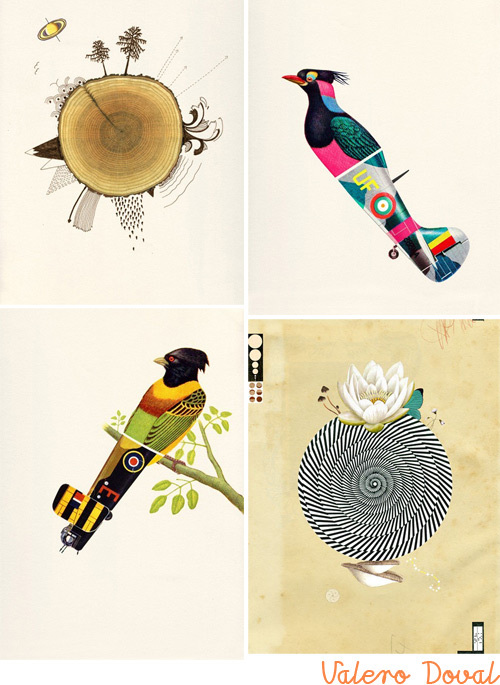 His "Aerofauna" series, or birds and planes, would be great in a boy's room. L'Daim Fille is artist Jennifer Parks who lives Portland, Oregon with her son and creates art, "for arts sake". 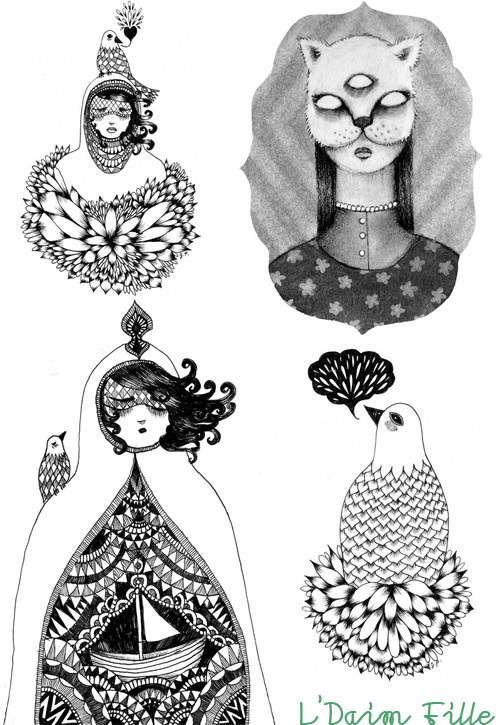 I think her hand drawings are interesting and would love to see some of them in vintage oval black frames arranged on a wall. 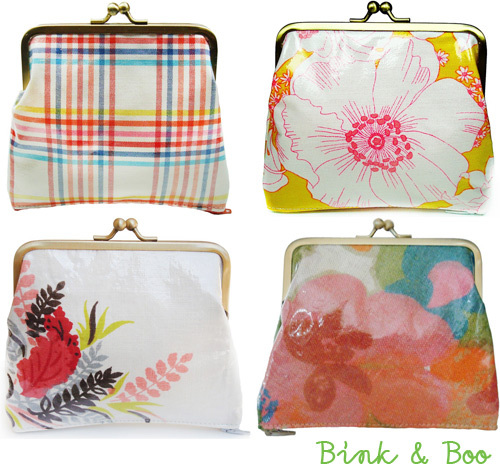 Bink & Boo live in coastal southern California and they love to scour thrift shops and estate sales for vintage fabrics to incorporate into their designs, from these fab pocketbooks shown above to bibs and baby shoes. I think all of these patterns could easily inspire a retro kitchen decor, don't you? I love the thought of having a little country cottage with plaid cafe curtains, chairs that don't match painted in bright colors like chartreuse and coral around a vintage modern white tulip table, and some fun tea towels with trims resembling some of the floral patterns above. Hillary Bird in San Francisco has a very strong brand, the moment you see her work you know its a Hillary Bird creation! If you happen to be in her city this weekend, you can catch her work live at the Renegade Craft Fair at booth 171 from July 31 + August 1 from 11-7 p.m.